What Is the Rockwell Hardness Test for Metals? Simply put, the Rockwell hardness test is a method of measuring the hardness of materials. The Rockwell hardness scale is typically administered to characterize the hardness of metals, such as thin steel, cemented carbides, lead, aluminum, zinc, copper alloys, titanium, and iron. But the scale is also administered to test certain plastics. Hardness, as measured by the Rockwell scale, refers to resistance to penetration. The test gets its name from Stanley P. Rockwell, who devised the test and original machines, later selling the rights to them. The test was first administered in 1919. 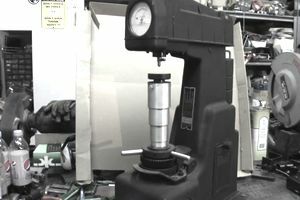 The Rockwell hardness test measures hardness in the simplest way possible: by pressing an indenter into the surface of the material with a specific load and then measuring how far the indentor was able to penetrate. Most of the time, the indenter is made of either a steel ball or a diamond. But, of course, the reality is much more complex, because metal samples vary radically. As a result, the same approach can't be used for all samples. In fact, there are 30 different Rockwell scales. Each uses a different combination of test forces and types of indenters. When choosing an appropriate scale for a metal sample, evaluators consider the size and shape of the test material, its homogeneity, and the limitations of each scale. While there are a number of Rockwell tests, the most common ones for very hard materials are Rockwell and Rockwell C. When the material is very thin, lighter loads must be used: the Rockwell 30T, 1ST, Rockwell 15-N, and 30-N scales. As you can see from these measurements, Rockwell hardness numbers feature a prefix that distinguishes the Rockwell scale used in correlation with the combination of load and indenter. There are conversion charts that will allow conversion from one method of hardness to another, but it must be remembered that these conversion charts cannot precisely convert from one to another. Most people who look at results from Rockwell hardness tests are unaware that multiple types of scales are available. Thus, they may not understand that conversion charts are not totally accurate. That's because Rockwell measurements have no units. As Sizes.com explains, "The symbol is HR followed by a letter indicating one of a number of possible scales. For example, 'HRC 96' means 96 on the Rockwell C scale." The Rockwell scale has been compared to the Mohs Test and the Brinell scale. The Brinell scale was developed by Swedish engineer Johann A. Brinell in 1910, and it operates as follows. A load is applied to a hardened steel ball that sits on a flat surface of the metal waiting to be evaluated. After this, the diameter of the dent that forms is assessed. According to Sizes.com, the hardness is measured with this formula: "The Brinell number indicating the metal's hardness is then the load on the ball in kilograms divided by the spherical surface area of the dent in square millimeters."